According to Nobles County Administrator and Blandin Broadband Community Steering Committee Chair Tom Johnson, the Worthington School District is the most diverse in the state. Thus, one of the goals of the Nobles County BBC Steering Committee was to use technology to implement programming for new Americans. One way they did this was through the myON Digital Library project. The myON program and tablet devices were purchased for use by Worthington schools, and utilized primarily by ECFE and ESL instructors at all grade levels. According to project implementers, the students and families who use the literacy resource are reaping great benefit. Project administrators report that both children and their parents have increased their English language skills through their participation. 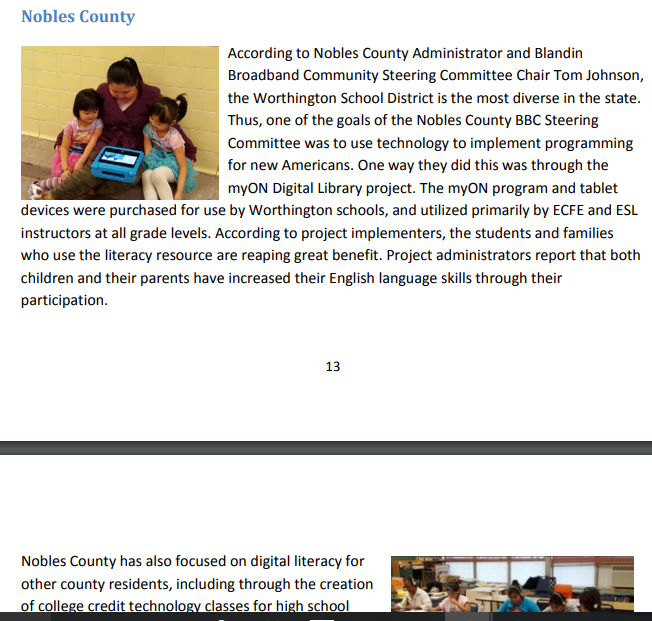 Nobles County has also focused on digital literacy for other county residents, including through the creation of college credit technology classes for high school students and digital literacy programming in alternate languages including Spanish, Tigrinya, Amharic and Karen. Participating immigrant families have learned how to use the computer for connecting with relatives back home, saving a lot of money on long distance telephone charges. Other projects in Nobles County increased public access to broadband, including through the installation of new public hotspots and upgrading to world-class symmetrical fiber the broadband connection available at the county’s flagship Biotechnology Advancement Center. For a more recent look at Nobles County – check out the Redwood County profile I did earlier this year.